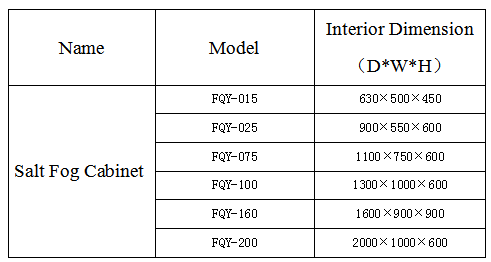 Fiber glass are used as the as the main structure of the chamber, making the chamber light weight, high resistance to rot and leakage, glossy appearance and making it easy to maintain. Air tight sealing to ensure no accidental of spray fog is emitted out of the test chamber. 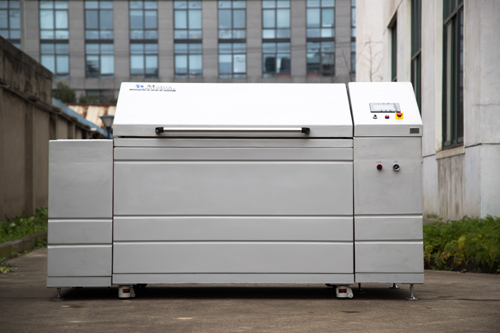 With an air-heated bottom, it makes the temperature raises faster, keeping it uniform, stable and accurate. At a 120 degree angle, the highly enforced cover ensures the mist is condensed on the testing sample. 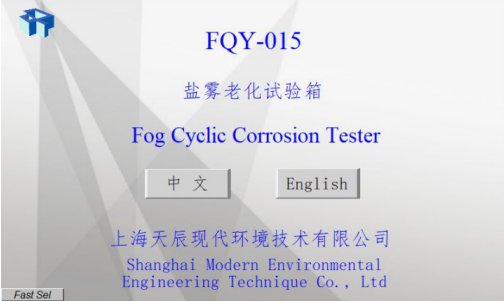 The spraying methodology is done either by a spray tower mounting in the centre, or an spray tower mounting on the top right hand comer of the chamber. 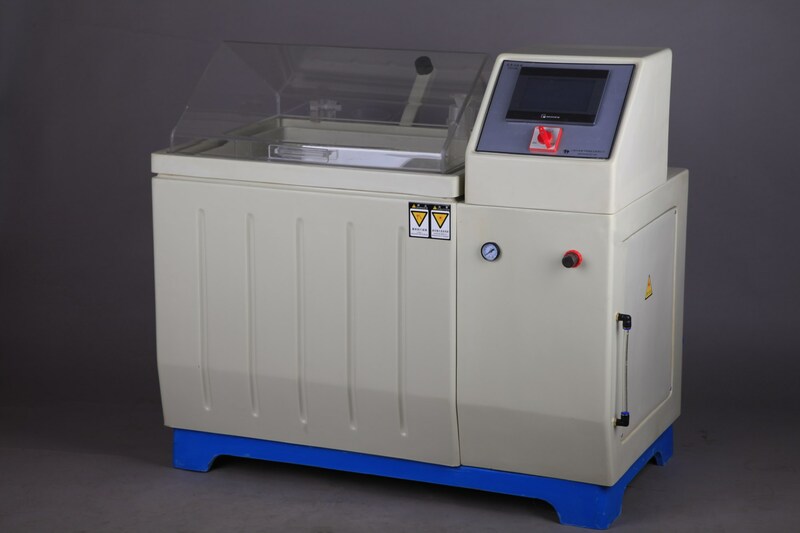 Quartz glass is used to ensure a fine mist is generated, with a natural settlement during the test. On the upper right corner, is the control panel of the chamber, where you can find the power switch, touch screen display w/ PLC control panel, protected by thermal heat control system. 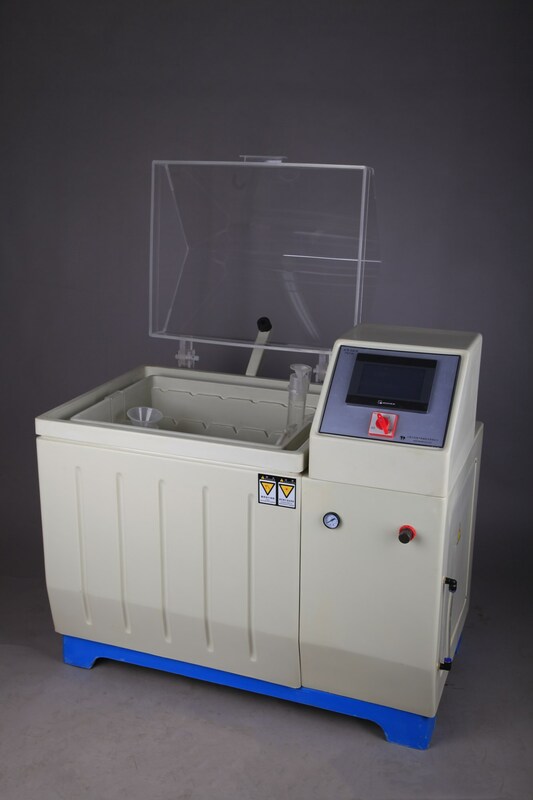 Spray tower or (baffle type): The built-in glass nozzle is used, and the spray is guided by the spray and dispersed or (baffle) to the inside of the test chamber. Spray regulator: Adjust the amount of spray volume, increase the amount of spray on the cone diffuser or (baffle) on the spray tower. The preheating tank is located at the bottom of the spray tower with comes with a cleaning drain, and is filled with salt solution. The water level of the preheating tank is controlled by a floating ball, which automatically control the water level. Containment: An 80cm2 funnel cup is used to capture the condensation, and leads into a measuring cylinder by a plastic hose. The weight limit of the shelving is capped at 2KG. If load is more that 2KG, the side holes can be used to withstand up to 10KG, and handing it an angle of 15 degree and 30 degree. 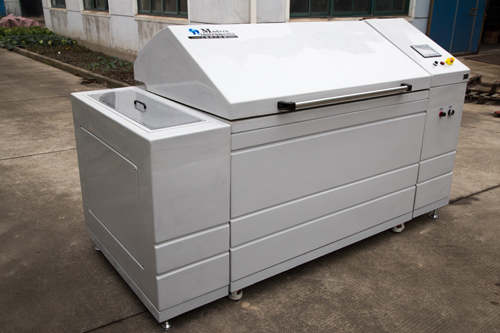 Waste containment：A maximum of 50ml of waste is allowed for the test. 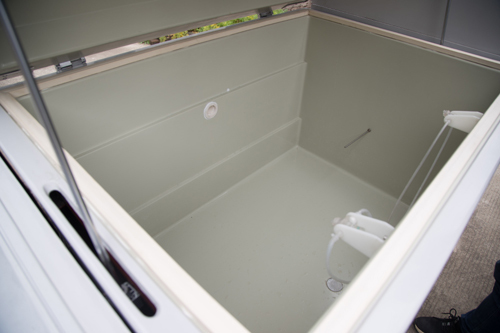 Stand-alone Tank：Use the principle of water seal to avoid leakage of salt spray. Saturated air bucket: Made of transparent acrylic and is found at the bottom of the chamber. The function is to heat and humidify the air from the bucket to make the air reach saturated humidity and spray to the nozzle. Air enters from the bottom, passing through the air bucket, making the effect of the spray more efficient, and this will not cause crystallization and block the nozzle. Cover: At a 120 degree angle, the highly enforced cover ensures the mist is condensed on the testing sample. Pressure gauge: Display of pressure inside the chamber, and the pressure of spray. Exhaust pipe: 1/2” diameter pipeline is connected to the drain pipe to discharge the waste water. Temperature controller: Control the temperature inside the chamber, according to required standards. Saturated air bucket temperature controller: Control the air temperature inside the bucket. Timer: Setting of time from1min – 9999.99hrs. Reset to zero after it stops automatically. 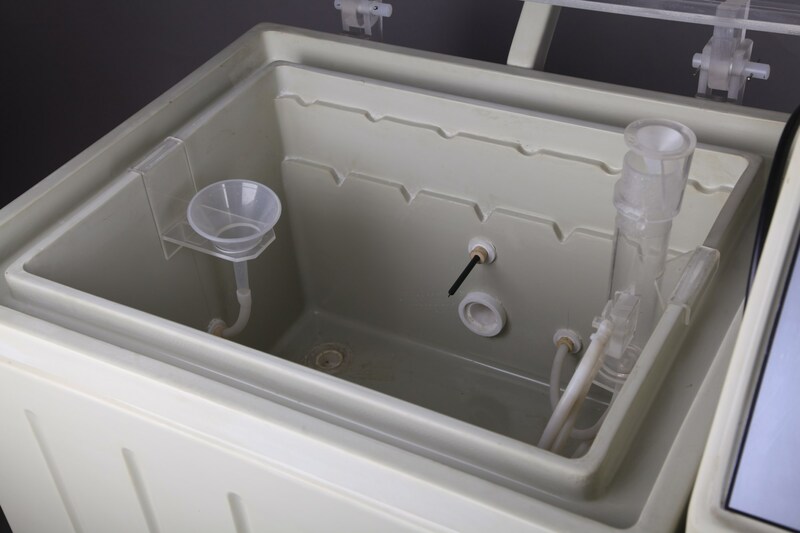 Saturated air bucket: Ensuring minimum water level, to avoid malfunction of instrument. essure gauge, oil moisture filter, solenoid valve, spray generator and pipeline. 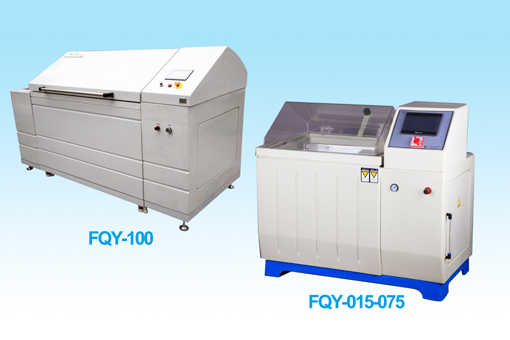 The function of the system is to continuously supplying the needed pressure and clean air that is required for the test. 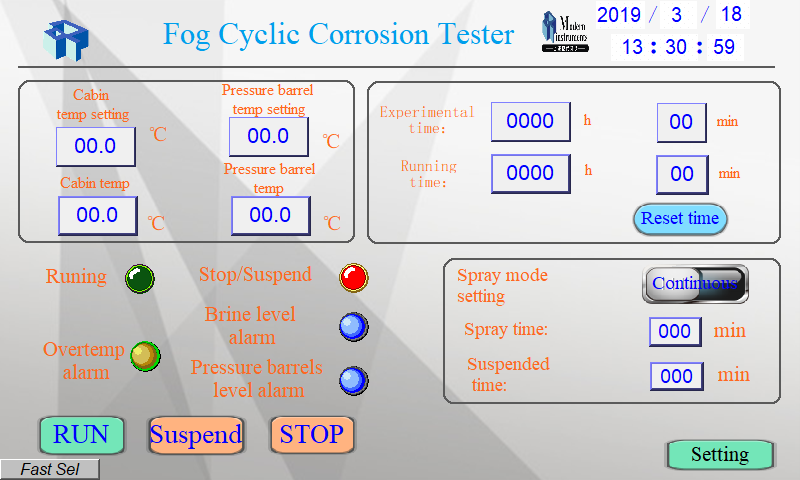 After the air is compressed again, using oil-water separation, filtration, pressure regulation, and the saturator heating, the nozzle pressure is always maintained in a stable state, ensuring a smooth salt spray test. This is a combine structure of a salt water tank, a high temperature resistant, corrosion resistant silicone tube, and a spray tower. The high pressure airflow creates a negative pressure through the nozzle, forming a siphoning action to draw the salt solution from the tank and generate the spray from the spray tower. Connect the power supply and tubing in place. Connect the discharge pipe and exhaust pipe in place, filled up the water in the separator tank till top. This is to prevent accidental of discharge of mist. Once everything is in order, select your language. 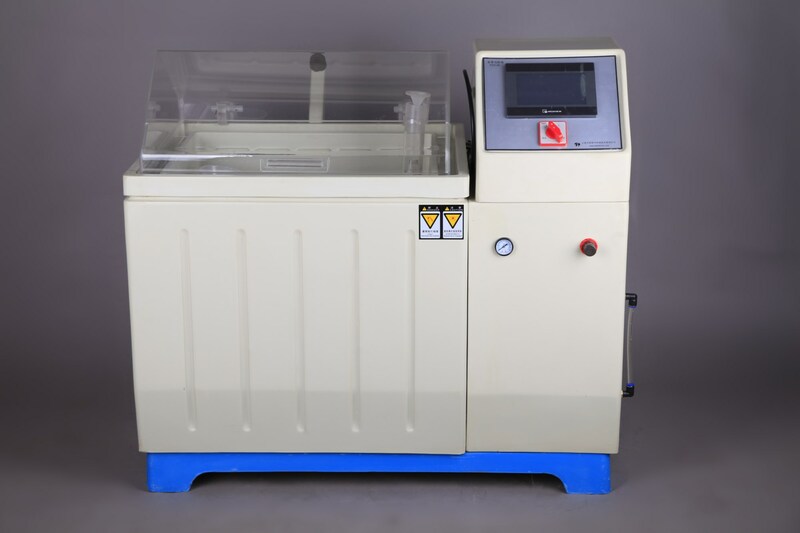 Set the test chamber temperature and saturator temperature value; (the general test temperature is set to 35 ° C; the saturator temperature is set to 47 ° C). 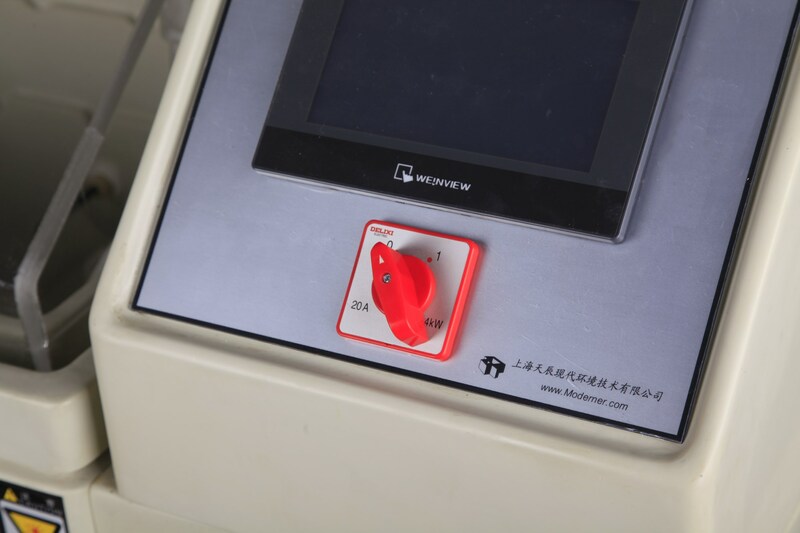 The control value of the over-temperature protector in the control box is generally set at 55 ° C to prevent the temperature control instrument from malfunctioning and burning the cabinet. 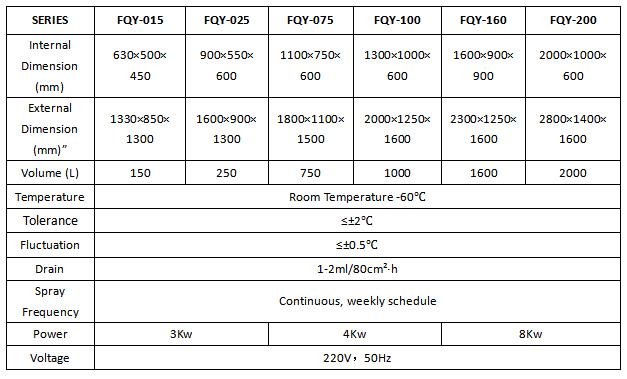 When the temperature in the working room exceeds 55 °C, the over-temperature protection will automatically cut off the total power supply, and the user should not arbitrarily adjust the protector. 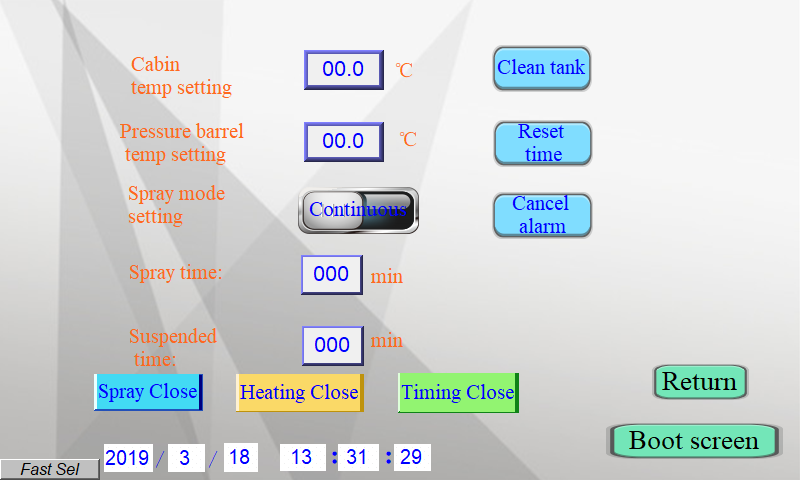 The atomization, heating, and timing functions can be turned off during the experiment. Press the release alarm to delay the over temperature and water level alarm. 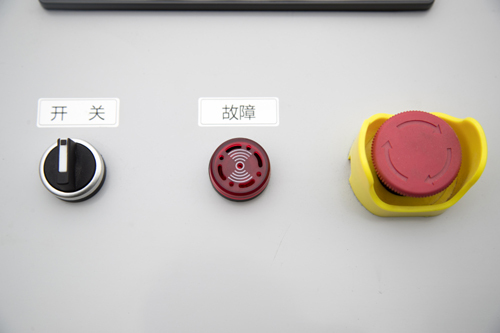 After the end of the test, the power should be turned off, the mist switch should be turned on, and the excess salt spray inside the box should be discharged to avoid contamination of the room. Then close the valve of the air compressor connection box. Adjustment of the amount of spray: The airflow spray generally adjusts the pressure value or changes the cone height of the tower to obtain the specified salt spray settlement. 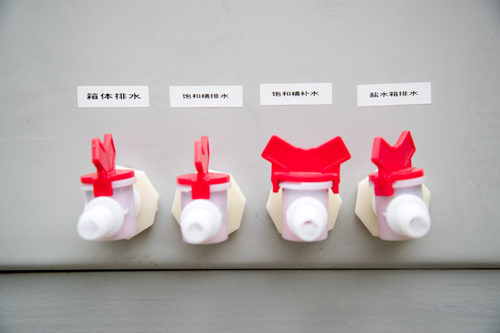 Under normal circumstances, adjust the distance between the bottom plane of the tower cap and the spray port. According to the settlement amount, it can be adjusted between 25-35mm. These would have been adjusted before leaving the factory.